Last year country exported 22.8m hectolitres, much of which was bulk sales that offer tiny margins and perpetuate image of Spanish wine just being cheap plonk. Spain has outstripped France and Italy to become the world’s biggest wine exporter, exporting 22.8m hectolitres in 2014, a 22% rise on the previous year. 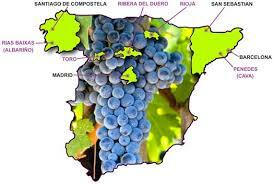 However, because much of it was bulk sales with small margins, the Spanish wine industry’s profits were down2.2%. France is now the biggest buyer of Spanish wines, importing and bottling – often as French wine – 5.8m hectolitres in 2014,40% more than the previous year. A hectolitre is equivalent of 133.3 bottles. It is cheaper for the French to import the wine than to grow it themselves. The next biggest buyers after France were Germany, Portugal and Russia. The situation mirrors in many respects the Spain’s olive oil industry. About 40% of Spanish production is exported in bulk to Italy, where it is rebottled and sold as estate bottled Italian olive oil.